The Mandela Park Backyarders | Umanyano Lwabahlali! Unity! The Mandela Park Backyarders will be marching in Cape Town to the offices of MEC for Human Settlements Bonginkosi Madikizela today at 10am. The march will demonstrate our disappointment in the MEC and his broken promise that he made two years ago. Two yeras ago, Madikizela wrote us a letter telling us that 80 plots in Mandela Park were to be given to poor backyarders in Mandela Park for the purposes of housing. Now, two years since the promise, the community is still in possession of this letter of empty promises. Since the letter was written to us, they have never followed up with us and have refused to meet with us or given us a blueprint for this development. At the same time, whenever we attempt to get his office to reply, they continue to ignore us. We are now sick and tired of begging him to fulfill the promise he has made. We demand that his office tell us exactly when they are planning on building these 80 houses and handing the land over to our community. We hereby send heartfelt condolences to all the bereaved families who recently lost their loved ones through state brutality on Thursday, 18th August 2012, in what has been dubbed “the Marikana Massacre”. This is written to all those who still feel oppressed by anti-poor laws of this country and to the optimism that still thrives underneath the anti-poor economic establishments of the government. We are all bound by our conscience to identify injustices committed against those who demand their right to a dignified life. All of us by now, through the atrocity committed by Lonmin, the government and the dominant trade unions, got a comprehensible illustration what happens to those who radically put forward their legitimate grievances. The constitutional obligations of this country protect “the right to life” for all our citizens until proven guilty in the court of law. Thus, the police had no right to “shoot to kill”, no matter what ill conceived justifications they put forth. This tragic massacre has brought a feeling of sadness to almost all South Africans – except the government itself. The lack of leadership and vision in our country is a cause of extreme concern. It is one thing for the state president to call for calm in the country and declare a period of mourning. It is another to hear the new police commissioner Riyah Phiyega making arrogant public pronouncements that spit in the faces and graves of the people that we were requested to honour and mourn. The citizens of this country must put to scrutiny the media coverage on this matter regardless of their said claim of independence. The daily inhumane and violent conditions those workers live under – itself a form of violence – has been cast into the periphery of the media coverage. Instead the primary focus is on the investors and the country’s reputation internationally. Have we regressed to a level where the lives of our people are juxtaposed with their monetary value? The government has dismally failed to ask: How did we end up here? What type of the country allows its people to be exploited by wealthy foreigners in this diabolic manner? If the are hundreds of workers arrested for the suspected killing of two police officers during the strike, why are there no police arrested for mass-murder which is also linked to the same event? One does not need to be a rocket scientist to anticipate what will transpire in the Zuma-appointed commission of inquiry. We are already too suspicious and doubtful about the outcomes of the inquiry as it already seems to us biased in favour of those who oppress us. The above questions seek to invoke critical thinking about the characteristics of this country. We have bared witness to President Zuma in a business press conference reading a speech of sympathy rather than outrage. This clearly shows what he read on that speech did not come from his heart, but were the words of someone else. He is painted as a sympathetic leader when he does not actually care at all, else resignations would have taken immediate effect. The mere fact he read a speech to console his people is not expected from an African elder, especially, a leader of his caliber given the fact that he was positioned as “a leader of the people”. We might be wrong, but given how our leaders have reacted to this matter, it leaves a lot to be desired. We condemn state response with high-level contempt. We support the inquiry but it should not be limited internally, SADEC should also appoint an inquiry that will also look deep into this matter. We also call on Lomnin mine bosses to be accountable about the mass slaughter. We also demand the employees to be granted their demand of R12 500 before they return to work. The president should issue a warrant of arrest to all 3000-armed police that murdered the workers. 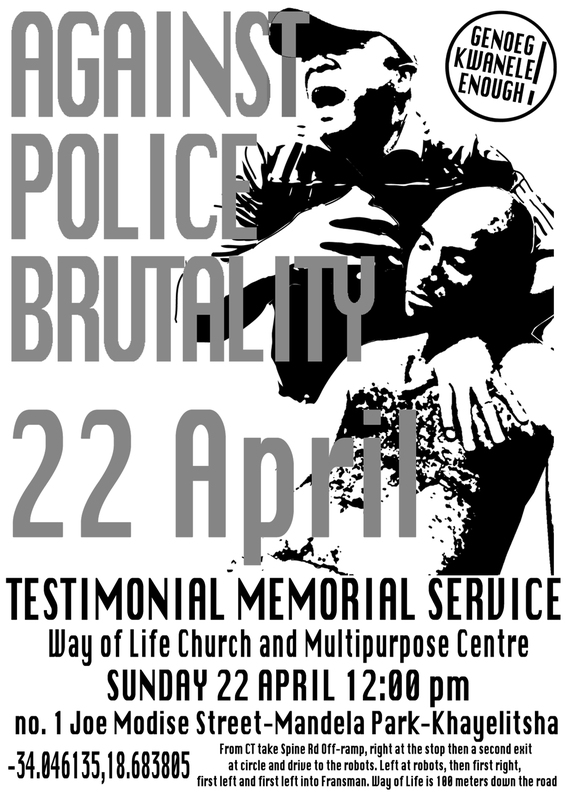 We also welcome the call that national MEC of police Nathi Mthethwa and Commissioner Phiyega should step down. We also plead with all social movements locally and internationally to pledge solidarity with the Marikana mineworkers. Welcome to Hell: We are all Andries Tatane! We are all Andries Tatane! There is a little bit of Andries Tatane in each and every one of us. The recent statement made by Helen Zille which refers to Eastern Cape migrants as refugees and her subsequent justification of the term, illustrate her failure to understand how apartheid has misguided not only those blacks who were and continue to be oppressed, but also privileged white people. Solidarity: We “invaded” Rondebosch Common…but only the police destroyed the fynbos. We did our best. We had everything stacked against us. The might of the South African Police Force, the paranoia of some Rondebosch rate payers, and the arrogance of our protester turned mayor Patricia de Lille. As a former activist, de Lille should know the law with regards to gatherings. She should already know that she can’t ban a protest without meeting with us first and without credible threats of violence that could not be assuaged through the meeting. This was an illegal act and a violation of our Constitutional rights and the specific procedure that the City is required to follow according to the Gatherings Act. It was also clearly illegal that they stopped and threatened people who protested in small groups, given that only groups of 15 or more constitute a legal gathering. Note: To our supporters of our struggle and to the media, the following letter was sent to the Khayelitsha Development Forum. They seem to have ignored our overtures towards having an open and productive discussion with them. It is unfortunate that they continue to claim that they represent us but yet are not even willing to meet with us! We, as the unemployed community of Khayelitsha, hope that our actions will force the democratisation of the development process where we as the community have a say. As Backyarders we view the security forces including the police as part of those who are suppressing poor people from raising in public genuine issues that affect us. The state including SAPS maintain the fear of a possible mass rebellion and are embarking on psychological intimidation and physical brutality against us. As social activists, we are not shaken by the actions of government. It is clear this government does not like its own people but only appreciates those who always follow their line. If you are strongly and actively opposing the agenda of those in power, then you get punished. Tomorrow at 12pm, Khayelitsha residents will be meeting with KDF (Khayelitsha Development Forum) and the Khayelitsha Hospital officials in their quest to reverse what they believe is a fraudulent recruitment process. for the newly-built Khayelitsha Hospital. This was disclosed by a District Health Services official after about 50 angry Mandela Park residents protested outside of the hospital yesterday, claiming they were not given preference for jobs at the new facility. Their protest came as Khayelitsha ward councillors said unemployment in the township was increasing every year.